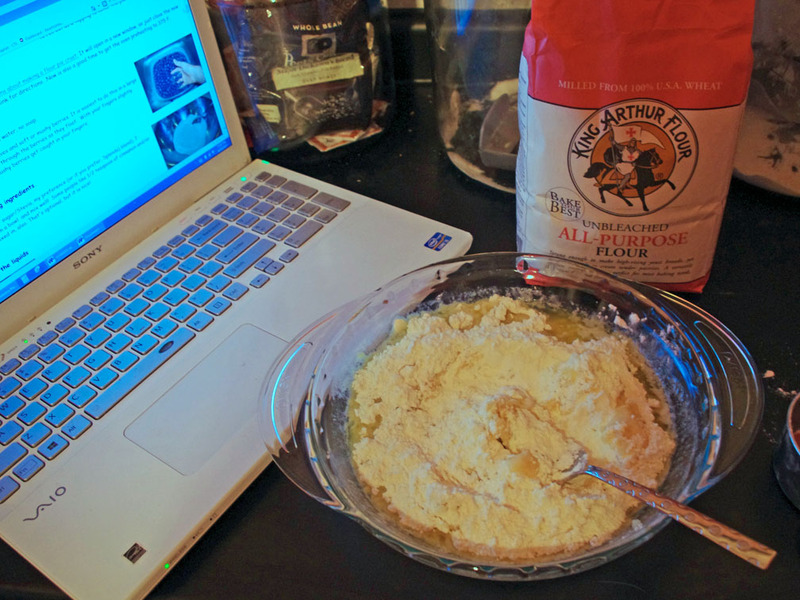 It is time for my first recipe review! I’m very excited about this entry because I love to bake. Many people like to bake because they like to see their families and friends eating and enjoying their delicious, homemade treats and because crafting something particularly tasty and/or attractive can be very rewarding. It’s a hands-on hobby. I love baking for all of those reasons and also because I use my baked goods to make people love me. Consider the following scenario: you and your friends decide to take a covered wagon West to settle in the last frontier. You’re just lousy with Manifest Destiny. But, alas, you get stuck on top of a mountain in a weeks-long blizzard, and, slowly, you all start to starve to death. The only food you have left to share amongst you is flour, sugar, butter, and some dried fruit. You consider murdering and eating each other because why not? Who are you going to spare–the idiot who can sew or the lovable, brilliant, and unappetizing-looking baker? We all know the answer to that question. I can tell you this: none of my friends have ever been sorry to see me enter a room when I’m carrying a tin of homemade brownies, not even the ones who find me mildly irritating. So, obviously, it’s important that we all learn to bake. 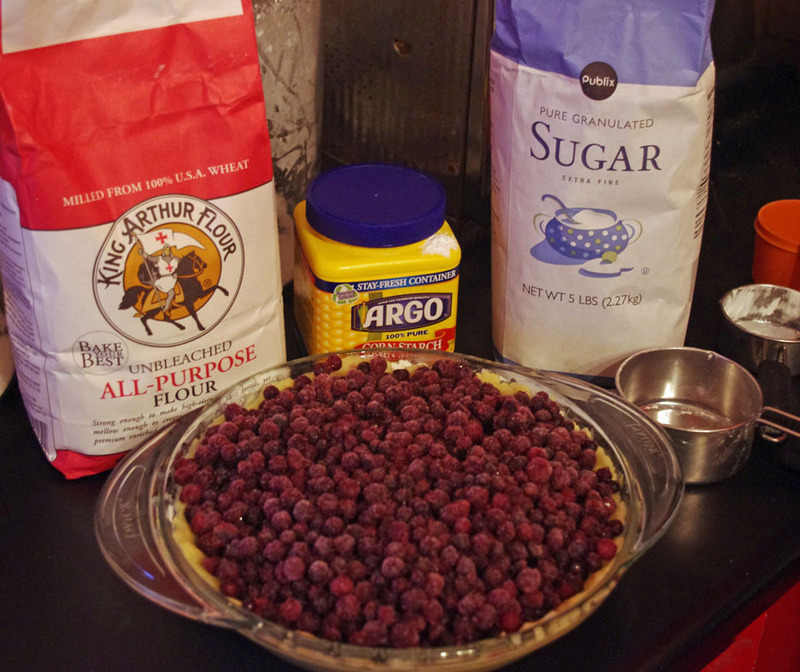 So, to begin, I found the world’s best blueberry pie recipe several years ago, when I decided to become a Thanksgiving meal pie expert because pies are, by far, the most important and time-consuming aspect of any Thanksgiving meal. (If you sense derision on my part regarding non-dessert foods, you would be correct. I eat the corn and the turkey so that I can eat the pie–and so that I can not die a violent death of vitamin deficiency. If mild vitamin deficiency can cause violent death. At the very least, it can cause funky fingernails, which I personally would like to avoid.) 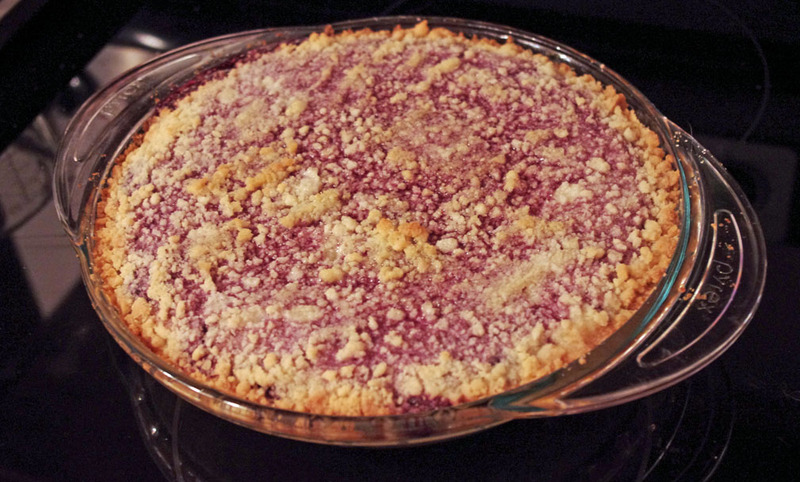 BUT, I wanted to make a variety of from-scratch pies without having to expend a huge amount of time or effort. Look, there’s no way of getting out of the work of an apple pie. Canned apples are a disgusting bane of human existence, so one must always, ALWAYS use fresh, peeled, cored, and sliced apples. Period. However, other pies should not have to be so time-consuming, which is why I went on a hunt for the best and easiest blueberry, cherry, and chocolate pie recipes. My hunt took approximately five minutes on Google (I’m kind of lazy), but I’m still using the same three recipes today that I discovered four years ago. Obviously, then, the recipes are not mine, and I have no desire to claim them as mine. They are entirely the creations of other people; I’ve only tweaked them as necessary for my purposes. So thank you, pie recipe people! We all thank you. 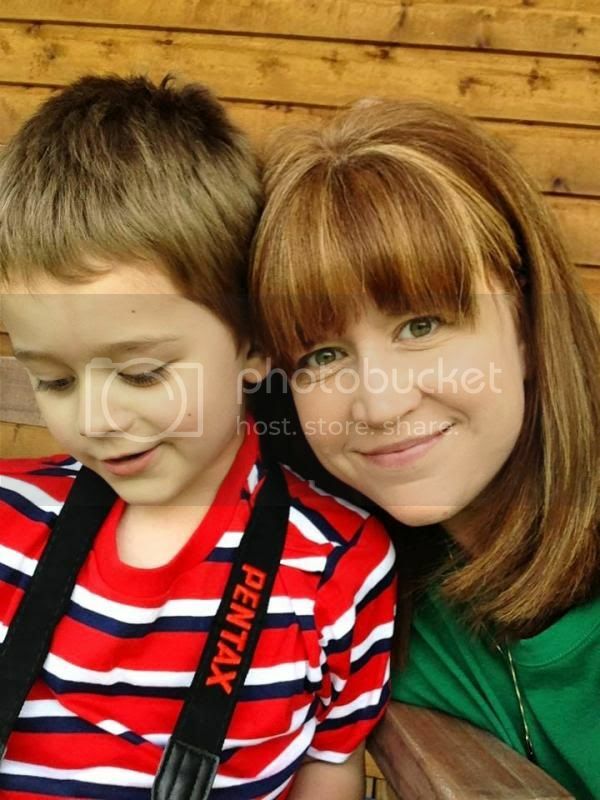 Today, we address the blueberry pie recipe, which I found on a website, PickYourOwn.org, that is designed to help users find pick-your-own (fruit) farms near them. They literally call the recipe the world’s best blueberry pie recipe, so I took the name to heart. Also, it looked incredibly easy, which is why I chose it (because I’m lazy). I’ve made this pie countless times now, usually for my husband (Terry) on random days throughout the year because it’s become his favorite food, but also for Thanksgiving. Terry has requested pie and commented on it on Facebook so many times that one of his friends said two years ago on Facebook, “Y’all sure do have a lot of pie up in there.” You are correct, Jeremy. You are correct. 3-4 cups of blueberries. If you use fresh, rinse them well. If you use frozen (I usually do–the frozen wild blueberries are divine), also rinse them well because the pie filling “juice” will be too runny if you don’t. I have to be honest–I think I use more than 3-4 cups, but I have big pie pans. It really depends on your pie pan and your pie filling thickness preference. 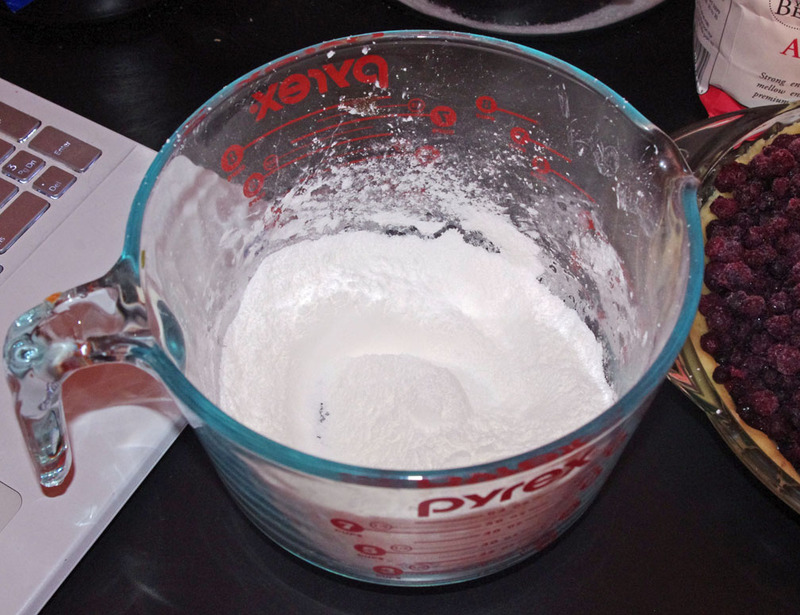 7 tablespoons corn starch–I just use not quite a 1/2 cup. Who wants to measure out seven separate tablespoons of corn starch, the most irritating ingredient known to man? 2 tablespoons lemon juice. If you don’t want to use lemon juice, just substitute more water for it. Use less liquid, in general, if you want a tighter filling or if your berries seem overly juicy. You will need to tweak and experiment, as it all depends on your filling preferences, your altitude, your berries, and, of course, karma. And now . . . the process. Melted butter with flour and salt added. 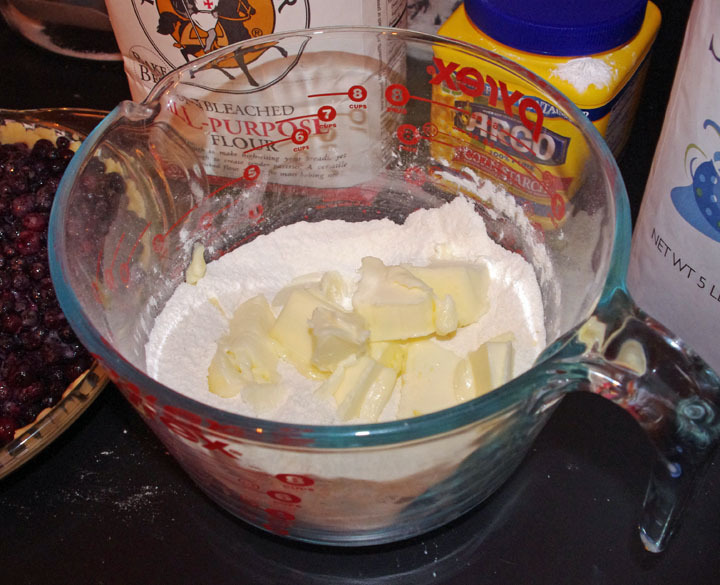 Mix together with fork until ingredients are thoroughly mixed together. Then, pat it out so that it covers the bottom and sides of the pie pan. Pat out melted butter, flour, and salt so that it covers the bottom and sides of pie pan. 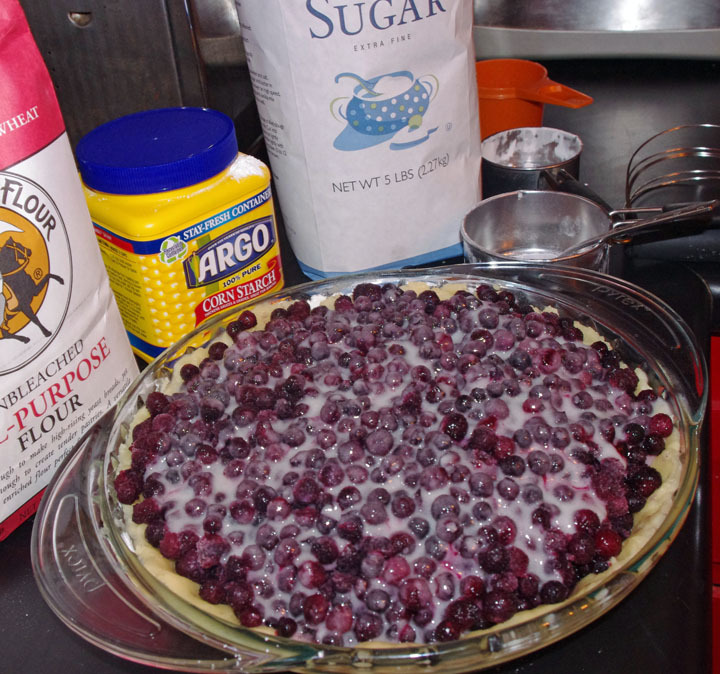 Then, pour the plain blueberries into the pie pan. As you can likely see from the following photograph, I was too lazy to rinse my frozen berries, but I DO recommend that you rinse them so as to end up with a tighter pie filling when it’s baked. Pour the plain blueberries into the pie pan. In a separate container, mix the corn starch and the sugar together with a fork and then add the water and (if you like) the lemon juice. Mix with fork. Pour the corn starch/sugar/water/lemon juice mixture over the blueberries. Now, for some reason, my top crust sometimes sinks into the filling, as you see in the picture above. I don’t know why. It does it even when I’ve rinsed the berries sometimes. It doesn’t really matter, as the buttery and sugary deliciousness is still there, somewhere, but it doesn’t look quite as pretty. I get no complaints from the pie-eaters, though, so I don’t worry too much about it. And there you have it–the world’s most delicious blueberry pie! This recipe has brought our family much joy in the last several years, so I hope you enjoy it, as well. May you enjoy many pie blessings as you embark on your own pie-baking journeys–godspeed, pie lovers! And may your friends never become cannibals, or, if they do, may they decide not to eat you but simply to make you their pie slave, instead. Addendum, re: gluten-free pies: In the last couple of years, I’ve experimented here and there with gluten-free baking for my friend, Angie, whose intestines will explode if she eats gluten (or something like that–I’m not a doctor). As I am a person with a raging sweet (and carb) tooth, I am horrified by the gluten-free diet. It’s horrifying. It’s almost worse than giving up sugar. However, it is not only possible but easy to modify this recipe so that it’s gluten-free. 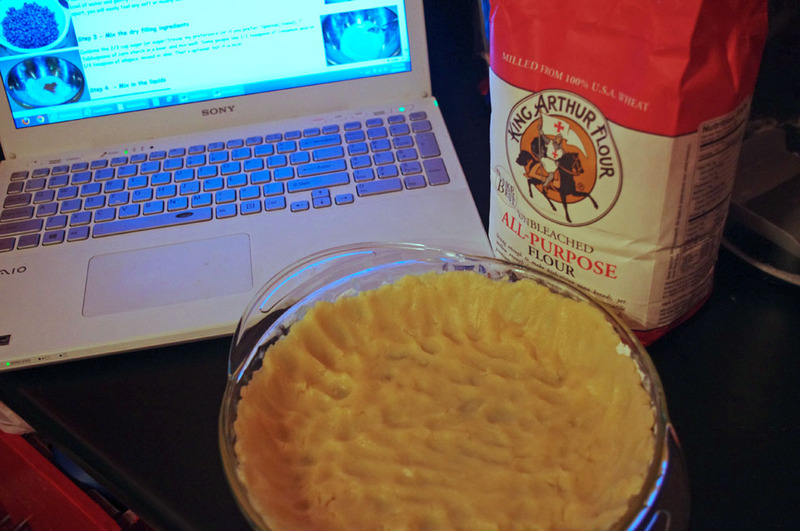 It’s easiest to buy the gluten-free pie shells (for the bottom crust) at Whole Foods and then to make the top crumble crust using the King Arthur gluten-free multi-purpose flour instead of regular flour. It doesn’t bake up quite the same, but it tastes just as good (so I’m told). 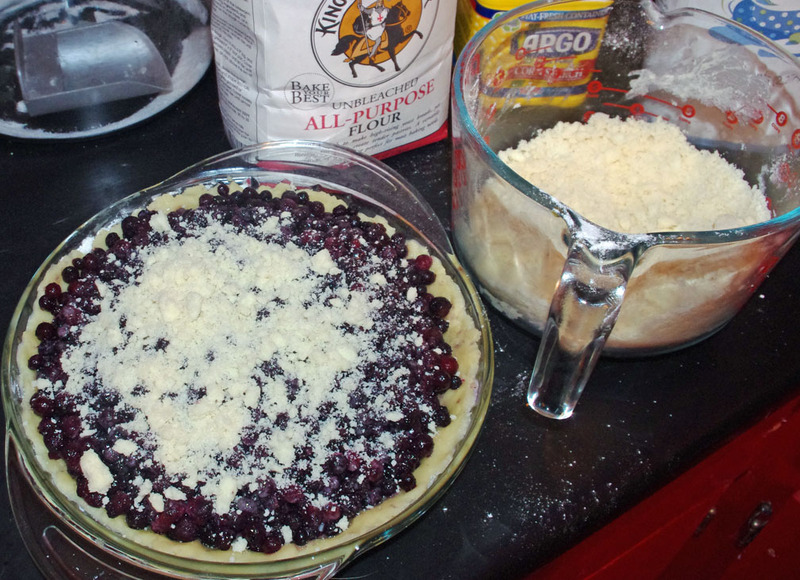 This entry was posted in Recipes and tagged baking, blueberries, blueberry pie, King Arthur flour, recipe, recipe review. Bookmark the permalink. ← Because, sometimes, PMS should ruin everyone’s night.